Yesterday morning was one of these relaxing and fun Sunday mornings that I had really missed because of the exams. Dimitris and I grabbed a coffee from Starbucks and then we went to this park near my appartment, which is amazingly beautiful. My outfit has many romantic touches like bows, lace and polka dots. The jean shorts puts a more edgy touch and kind of balances the whole result. The scarf is a handmade - a gift from my mum who has a thing for anything handmade and I can't blame her. Yesterday I realized that in less than a month it's going to be the first anniversary of Nothing Like Fashion. I can't believe it's been almost a year I started this blog, time really flies doesn't it? Χθες το πρωί ήταν ένα από αυτά τα ήρεμα Κυριακάτικα πρωινά που μου είχαν λείψει εξαιτίας της εξεταστικής. Ο Δημήτρης και εγώ πήραμε έναν καφέ από το Starbucks και μετά πήγαμε σε αυτό το πάρκο κοντά στο σπίτι μου, το οποίο είναι πραγματικά πολύ όμορφο. Το outfit μου έχει πολλές ρομαντικές πινελιές όπως οι φιόγκοι, η δαντέλα και το πουά. Το τζιν shorts δίνει μια edgy πινελιά και έτσι ισορροπεί το όλο αποτέλεσμα. Το φουλάρι είναι χειροποίητο - είναι δώρο από την μαμά μου η οποία έχει μια αδυναμία σε οτιδήποτε χειροποίητο και δεν την κατηγορώ. poly omorfo!! auto to kokkino malli sou paei toso poly! sou dinei mia perissoteri lapsi! maresei poly to top me to short sou! wow enas xronos blogging! to ksero pos perna pol grigora o xronos..kai ego to genari klino ena xrono!! evlepa ta palieotera sou posts kai paratirisa poso exei anaptixthei to style sou! oi photos sou einai poly pio oraies tora vgarmenes enoo kai fenete oti exeis perissoteri autopepithisi sto fako! nomizo to niotho kai go auto me to blog mu meta apo ligo kairo blogging! 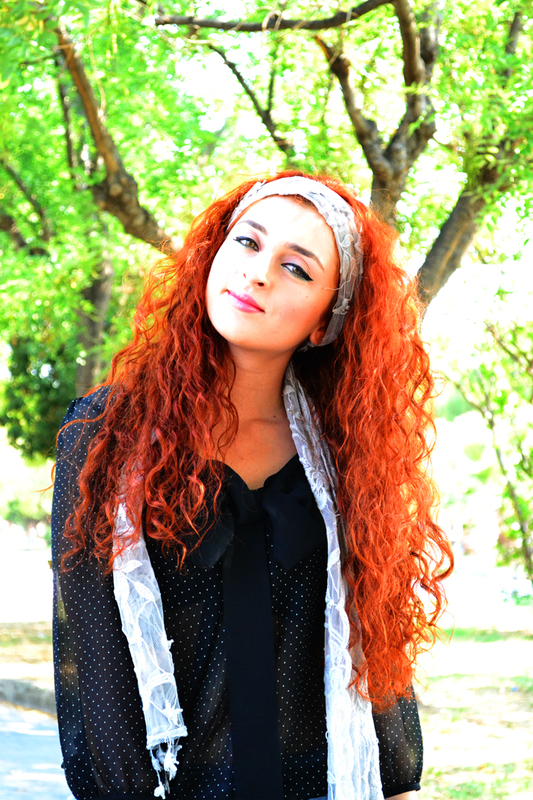 Your headscarf is so gorgeous <3 And I love your winged eyeliner; amazing! Thanks for stopping by my blog! Love the polka dot bow blouse you are wearing. Very cute. nice outfit. and i looove your hair!! Mou aresoun poli ta xrwmata stis fwtografies sou, kai i antithesi pou kanoun ta mallia sou me to background! Thank you girls, I'm glad you liked the result of the outfit! Αααααχ την μπλούζα τη λάτρεψα!!!! I love relaxing days like that! You have beautiful hair by the way. This look is adorable. I love that top! The shoes, also stunning. Great outfit!And your hair...just wahou! Thank you so much guys for your support! I loved the colors at these photos too, the trees look really amazing! These photos are amazing! Great outfit and you look so pretty!